Stew Magnuson and his book, "The Last American Highway: A Journey Through Time Down U.S. Route 83: The Dakotas"
Award Winning Author Stew Magnuson and his book, The Last American Highway: A Journey Through Time Down U.S. Route 83: The Dakotas will be featured on an upcoming episode of South Dakota Public Broadcasting’s Dakota Life television show. The program will be shown at 8 p.m. Central Time/7 p.m. Mountain Time on Thursday, April 7. Magnuson’s book can be purchased at the Heritage Stores at the Cultural Heritage Center and the Capitol in Pierre. As South Dakota Public Broadcasting’s number one rated locally produced show for the past 25 years, Dakota Life features interesting South Dakota people, places and things. Producers in September of 2015 spent a half day following Magnuson on Highway 83 from Murdo to Mission, South Dakota. 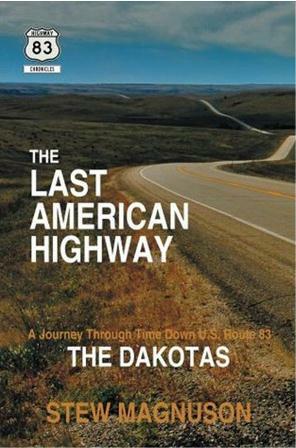 About Stew Magnuson and The Last American Highway: The Last American Highway: A Journey Through Time Down U.S. Route 83: The Dakotas, a nonfiction travel-history book that uncovers stories found along a road that bisects the states from north to south. Magnuson takes readers on a trip down the road and through the history of the Northern Great Plains. The famous and the forgotten are found in stories he discovers in the Dakotas. Explorers Pierre de la Vérendrye, Lewis & Clark, Jedediah Smith, are all encountered along with Chief Spotted Tail of the Brulé Lakotas, TV sensation Lawrence Welk and rodeo superstar Casey Tibbs. Cold-blooded killers, homesteaders, ballplayers and rail barons from yesteryear meet today’s truckers, oil rig workers and ghost towns inhabitants as Magnuson launches his own Voyage of Discovery.